Replacing your roof is probably one of the biggest investments to consider. An expense this large can become daunting when it comes time to search for the right price and the right company. That is why when you choose to work with RoofRoof we combine both affordability and quality for every job. Our honesty and integrity lie within our work, and we truly believe by advising customers to follow through with the proper upkeep of their roof will help them avoid costly repairs and even unnecessary roof replacements. We can accurately determine the strength, stability and overall condition of your roof and be able to advise you on whether or not you need a full replacement. As a contractor we specialize in roof replacements all throughout South Carolina, including Greer, Anderson, Greenwood, Simpsonville, Gaffney, Taylors, Hendersonville and surrounding areas. Call us today for a free roof replacement cost estimate in your area. We look forward to hearing from you! This Campobello home needed a full roof replacement due to the age of the roof. The customer chose Owen's Corning Oakridge shingles in Brownwood for the finished product. To say this roof was old would be an understatement, it was ancient! When this homeowner knew it was time to replace, he called Roof Roof. We came out and gave him a free, no-obligation estimate and he selected our company to do the job. We removed the existing roof down to the decking. Once all rotten wood was replaced, we installed ice and water shield in the valleys and around the chimney and synthetic underlayment across the field of the roof. We then installed Owens Corning Oakridge Onyx Black shingles. All fo the boots were replaced as well. A new cricket was installed behind the chimney to divert water to the left and right of it. On the flat roof, we installed new self-adhering rolled roofing due to the low pitch of the roof. All debris was cleaned up and hauled off. Another happy customer! This Spartanburg home needed its roof replaced due to age. The customer chose Owen's Corning Oakridge shingles in Onyx Black for the job. This Spartanburg property owner called Roof Roof for a roof replacement on a duplex she is currently maintaining as rental property. Two layers of shingles were already on the roof so we began by removing those, followed by the installment of synthetic underlayment. All plumbing boots were replaced and U.V guards were installed. The walls and chimneys were step and counter flashed as needed. Then the Owens Corning Supreme shingles in Williamsburg Grey were installed. We topped it all off with ridge vent to aid in air circulation. With the roof being over 20 years old, it was time to be replaced. We met this homeowner at the Greenville Remodeling Expo at the TD Convention center. We went to his Hendersonville house and provided an estimate for complete replacement. We started the project a few weeks later. We installed Owens Corning Oakridge Estate Grey shingles, new felt, and new flashing. The project took two days to complete. If you have a roof leak and wood rot or either of the two, sometimes the damage is severe and become far too expensive to fix. 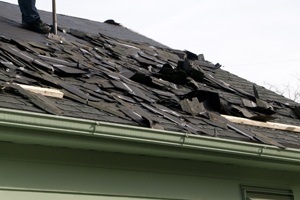 Any damage done to your roof, whether it is from a storm, heavy winds, or just everyday strain, can rack up hefty costs, which is why total replacement is often times ideal. "Wish there was a "10" rating"
"Friend recommend y'all said y'all did a great job for them"
"I would certainly deal with Roof Roof again and recommend them to others." "The process was unbelievably easy from start to finish. We are very happy..."
Very knowledgeable, patient in answering questions. "Crew did an excellent job with cleanup and actually did cleanup during the..."
Crew did an excellent job with cleanup and actually did cleanup during the installation process. Plants and shrubs faired very well. "Matt definitely knows his stuff. He also found a leak in the main roof I..."
Matt definitely knows his stuff. He also found a leak in the main roof I didn't even know I had. He answered all my questions and came right out when I called about the rippling in the new roof and checked it out. "Honesty of sales rep and word of mouth"
Headquartered in Joplin, Missouri since 1944, TAMKO serves its customers with innovative, professional-grade roofing and decking products. Beautiful. Strong. And ENERGY STAR® qualified. IKO is a family-owned company that is committed to manufacturing quality residential and commercial roofing products since 1951, with the company motto "Setting the Standard" to embody the quality, durability, and innovation they do every day. For beautiful protection that’s engineered to last, IKO roofing shingles set the standard. You’ll find the perfect roofing shingles for your home in one of IKO’s three collections: Architectural, Premium Designer or Traditional 3-Tab. Traditional 3-tab shingles remain a popular choice for homeowners looking for affordable weather protection and a huge selection of beautiful colors to complement their home. IKO's architectural shingles are the most popular choice. They are available in a wide array of patented color blends and their high profile and dimensional thickness will enhance the look of any style home. Cambridge roofing shingles have one of the heaviest mats for superior weather protection. Premium Designer shingles offer the ultimate in weather protection and provide the look of natural slate tiles or cedar shakes without the maintenance. GAF offers three distinct levels of shingle quality and protection, plus a remarkably affordable slate shingle option. We'll help you select the one that is right for your home's design and location. You don’t just want a company that has all the right certifications and licensing. While those licenses and certifications are important and crucial to the company’s existence in the first place, reliability, credibility and the relationship you build with a contractor is far more important than anything. Here at RoofRoof we pride ourselves on providing unmatched customer service and quality, reliable solutions. We want to work WITH you to achieve the results you want, with a price you can afford and be satisfied with. If you live in Spartanburg, Greenville, Easley, Anderson, Greer, Simpsonville, Greenwood, Taylors, Hendersonville, Gaffney, or any other area in Greater Greenville, call us today to schedule a free roof replacement cost estimate.